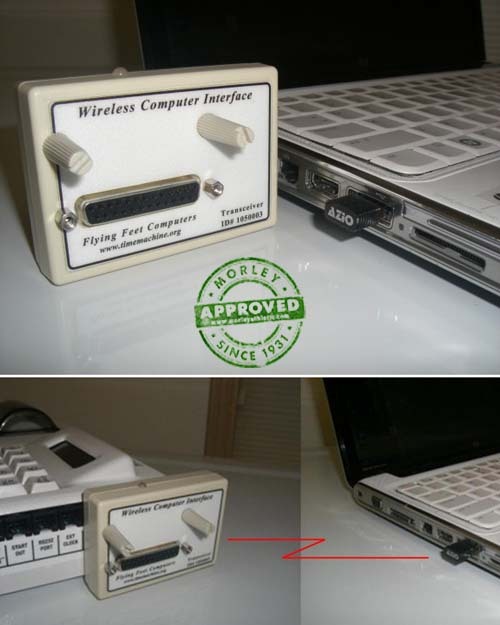 The Time Machine Wireless Computer Interface lets you use a standard USB port to transmit information from up to 400 feet away. Plug-and-Play replacement of the standard computer interface cable. Transceiver unit plugs into Time Machine’s Multilane port. Micro USB adapter connects directly to computer’s USB port. Wireless connectivity up to 400 ft depending on obstacles. Compatible with all existing scoring software – emulates a standard serial port. Provides large data buffer with error detection and correction for a robust data link. Provides secure connection with unique ID code prohibiting unauthorized access to your data. Output connector extends Multilane port signals from Time Machine for normal use.